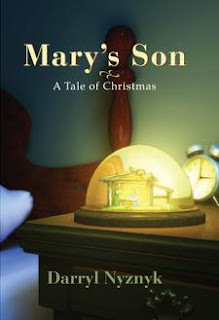 Mary’s Son: A Tale of Christmas (Cross Dove Publishing), winner of three Mom’s Choice Awards, is a modern-day story in which a mysterious old man named Nicholas shares the true meaning of Christmas with two young people. Sarah Stone is an 11-year-old rich girl who lives “on the hill” amid butlers, nannies, housekeepers, and a father who is too busy for her. Jared Roberts is a 13-year-old tough kid from the “sink” on the other side of town where he and his gang barely survive broken families. Both Jared and Sarah struggle with holes in their family lives: Jared’s father left his family in poverty, while Sarah lost her mother as an infant. On the night that Jared plans to burglarize Sarah’s home, the two are whisked back in time by Nicholas, to witness a Christmas from long ago where they learn the meaning of life in a way they never imagined. Together, their personal anger and hurt dissolves, inspiring them to convey the true Christmas message to a cynical world. Mary’s Son is a story of youthful fears, passion, and tears that gives readers of all ages hope for a better world. Like the iconic Christmas image of Santa Claus kneeling before the manger, the story moves readers of multiple generations, as it allows parents to demonstrate the true meaning of Christmas, while still allowing young people to identify with the more secularized traditions of the season. “In a time of social divisiveness in our country, this story brings to the forefront the unifying values of honor, integrity and love on which America was built,” says Nyznyk. “This story will resonate with all who are tired of ‘political correctness’ and long for the unifying joy of the real Christmas.